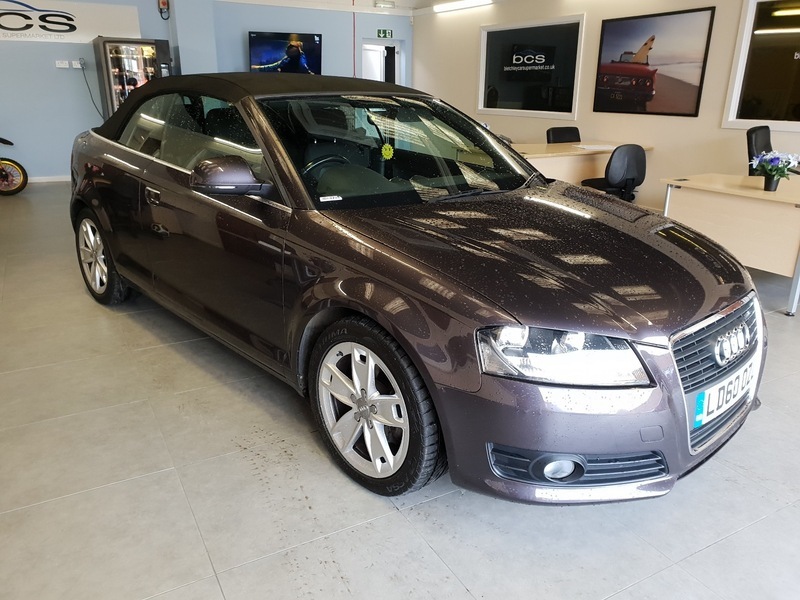 Audi A3 Convertible 2.0 TDI Sport, Diesel / Auto, Finished in Grey. This car has everything, it is convertible for there summer, has 4 seats for a family and benefits from an Automatic gearbox making the driving experience a pleasure.The car is in really nice condition, the bodywork is good and the interior is lovely, the engine runs smoothly and the auto gearbox drives nicely. Being a sport model this car is really well spec'd and comes with 17" Alloys, climate control, electric windows / mirrors, parking sensors, daytime running lights, MP3, Stop / Start engine and steering wheel controls. This car has done exceptionally low mileage, on average it has only covered around 5500 miles per year which is exceptional for a Diesel engine and being German you would expect this car to last for a long time. The day to day running costs of this car are affordable, it offers 138 BHP and returns 55.4 MPG whilst tax is only £140 per year. This car is bing offered at a fantastic price for a car in great condition for the age and mileage, the price includes a 6 month dealer warranty and 12 months AA cover, we don't expect this car to be available for long!